Here is another family favorite summertime recipe. This time of year, this strawberry Jell-O angel food cake is even better with fresh strawberries from your garden or the farmer’s market. I know there are many different variations on this recipe, but this one has served us well for several years. You can also mix the Jell-O right in with the whipped topping itself to make layering even easier. Let me know how you make it by leaving your reply below. 1 box strawberry Jell-O, 3 oz. Slice the angel food cake into three layers. Mix Jell-O and boiling water; allow to cool until it starts to thicken a little. 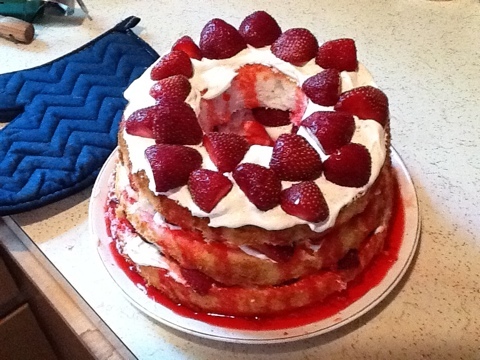 Drizzle a third of the Jell-O, then whipped topping, then strawberries, on top of the first angel food cake layer. Repeat with next two layers. Chill before serving. I like to use a wooden spoon to poke holes in the cake. Then, I pour the cooled Jell-O into the holes. Either way, it’s a fabulous dessert. I haven’t made one in a while. Now I am looking for a reason to make one!! That looks so good! Once my cake has cooled, I will pour the jello over the cake, chill till jello has set, then slice it into layers and add whipped cream and strawberries between layers.